The Lansan tree is endemic to the Windward Islands of Dominica, Guadeloupe, Martinique, Saint Lucia and Saint Vincent in the Eastern Caribbean. A member of the ‘Incense tree’ family (Burseraceae), the lansan tree, like its relatives, produces a highly aromatic resin. In Saint Lucia, where the tree is still relatively abundant, lansan trees are ecologically important species. In certain places they form as much as 10% of the rainforest trees and their fleshy fruits provide food for native pigeons and other wildlife. Resin produced by the lansan tree is both culturally and economically important; 60% of Saint Lucians use lansan resin, principally as a slow-burning incense. It is used chiefly by Roman Catholic churches and household shrines, and is also traded internationally. 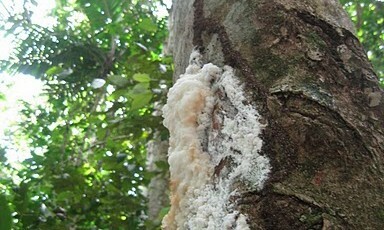 The white resin is extracted from the tree by slashing the bark, typically once, every one-to-two weeks. Over-tapping for the resin can swiftly lead to trees becoming infected and rotting. Surveys from 2009 observed many trees weakened or killed by hundreds of seemingly indiscriminate cuts. Even inside the Forest Reserves, unregulated extraction of the resin occurs. Threats from unregulated tapping and from rainforest conversion to agriculture have led to lansan tree populations all but disappearing across the Eastern Caribbean islands. In Saint Lucia, where a large but increasingly threatened population of lansan trees persists, there is still hope for the species. With support from the Global Trees Campaign, the Saint Lucia Forestry Department made a breakthrough discovery by developing a harvesting technique that causes no harm to the trees but still allows high yield of the culturally important resin. The Forestry Department has developed a management plan for the species and is training licensed resin tappers to use this new, sustainable method whilst continuing to monitor on-going impacts on the trees. Furthermore the team in St. Lucia has conducted a comprehensive population survey in the Windward Isles and, are drafting a proposal to update the species account on the IUCN Red List, using the information gathered by these projects. The final assessment submitted by the project indicates the species should be classified as Endangered. This profile was written by Arianne Davies, with input from Dr Jenny Daltry. The main photograph was taken in the field by Jenny Daltry.